In this long-awaited memoir, Kemba Smith shares her dramatic story, as it has never been told. 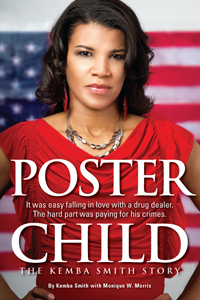 Poster Child: The Kemba Smith Story chronicles how she went from college student to drug dealer’s girlfriend to domestic violence victim to federal prisoner. Kemba shares her story of how making poor choices blinded by love and devotion can have long-term consequences. In 1994, Kemba was sentenced to a mandatory 24½ years in federal prison, with no chance for parole, despite being a first-time, non-violent offender. Fortunately, she regained her freedom when President Clinton granted her executive clemency in December 2000 after having served 6½ years. Kemba’s case drew support from across the nation and the world. Often being labeled the “poster child” for reversing a disturbing trend in the rise of lengthy sentences for first-time, non-violent drug offenders, Kemba’s story has been featured on CNN, Nightline, “Judge Hatchett,” Court TV, “The Early Morning Show,” and a host of other television programs. In addition, Kemba’s story has been featured in several publications, such as The Washington Post, The New York Times; and Emerge, JET, Essence, Glamour, and People magazines.